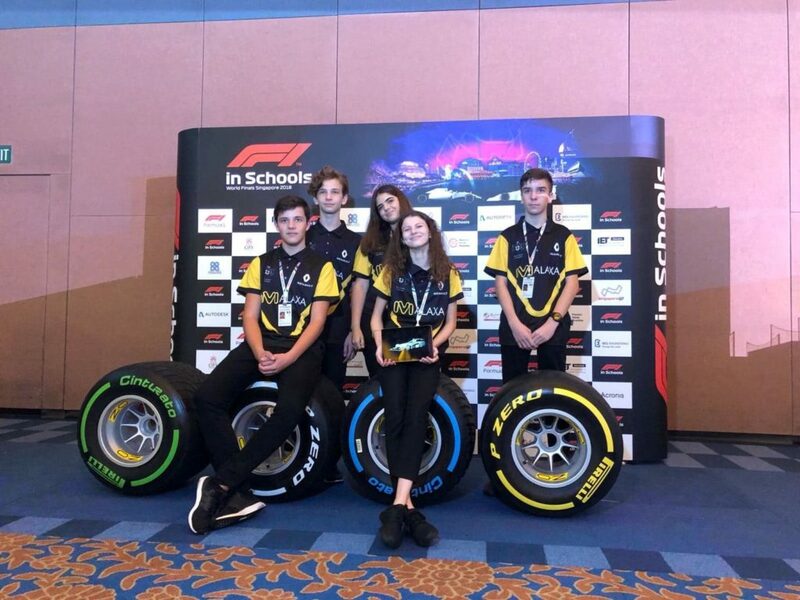 Team Malaxa, the only team representing Romania in the final “F1 in schools” competition in Singapore, has struck again with a prototype that not only looked good, but was also very fast: Malaxa’s car track time ranked 12th out of 50 teams worldwide! Emilia (Team & Marketing Manager), Lara (Graphic Design & Marketing Manager), Andrei (Financial Executive), Pavel (Manufacturing Engineer) and David (Manufacturing Engineer) are the members of this elite team and they are all British School of Bucharest’s students. They prepared tirelessly, for almost two years, to create this car and to make it as realistic as possible, just like a real Formula 1 car. The challenge was to design and build a miniaturized car model that can reach 100 km/h, with an aerodynamic design, utilising compressed air propulsion. The car’s speed and performance alongside the team’s marketing strategy, graphics, financial plan and sponsorship strategy, were aspects taken into consideration by the judges. After all these areas of review were taken into account, Malaxa was ranked 34th out of 50 teams worldwide. “During the Finals, we were against great and experienced teams. They used amazing technology and I was very impressed by their designs. This experience has taught us the level we have to reach, who our competitors are and how a final like this actually works. My students had the opportunity to experience, first hand, the complexity of the World Final and learnt a great deal about what the judges are looking for and the importance of even the smallest details. Moreover, now we know that every single step needs more attention, including the car, the strategy and the portfolio as a whole. We can clearly do more and knowing the determination of Team Malaxa, I am confident they will do even better. In fact, I know they will, because Malaxa wants to compete again! Having this Final’s experience fresh in our minds and learning so much, maybe next time we’ll reach the TOP 10 globally, which has to be our aim”, said Tudor Atanasiu, Malaxa’s team teacher. What did British School of Bucharest’s students do? They created a miniature F1 model, a unique concept car made of polyurethane foam miniaturised to a scale of 1/20th. It has aluminum wheels of less than 0.5mm thick and the whole car weighs less than 40g (unpainted). It sports titanium axles and complex aerodynamics, resembling a real F1 car. Not only does it look magnificent, this beast performs like a real F1 car! 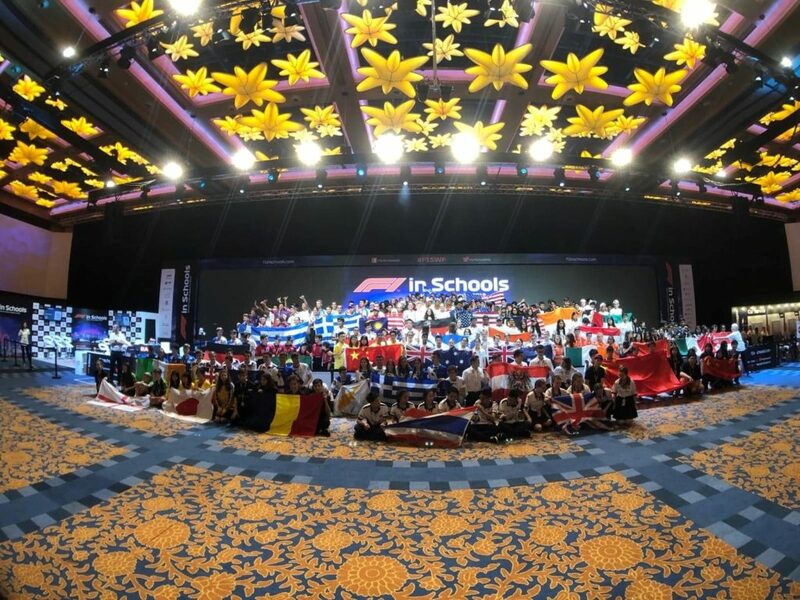 The “F1 in schools’ Final contest took place from the 9th-12nd September, in Singapore. 50 teams from all around the world competed to win the grand prix, which was judged by over 45 specialists from the industry, Formula 1 and education. For more info about Team Malaxa click here.